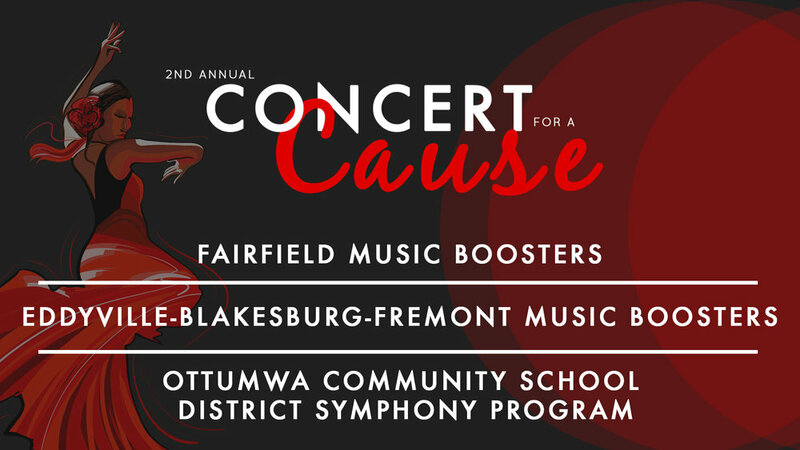 The Ottumwa Chapter of SEISO is proud to announce the recipients of the 2nd Annual Concert for a Cause: the Eddyville-Blakesburg-Fremont Music Boosters, the Fairfield Music Boosters, and the Ottumwa Community School District Symphony Program. In addition to private donations, the Southeast Iowa Symphony will donate 75% of all door ticket sales at the February 17th concert to the programs listed above. Last year, the event raised over $1,700 for the Ottumwa YMCA. "The concert will feature Kenoni Bolding, a young soloist and our young artist competition winner, which is a high school student from the area" said Dezirae Fairchild, a music director at Eddyville-Blakesburg-Fremont and musician with the SEISO. "This will be a great opportunity for our students to experience high quality performance and show them what is possible for young musicians around their age." The one night event will begin at 6:30 with a pre-concert social. "There will be free food, a cash bar, a special photo booth, and a wonderful pre-concert lecture by our conductor Robert McConnell. We're even going to feature each of the student programs with small performances in the lobby. This is going to be a real event - one that you won't want to miss" said Steve. The concert will begin at 7:30 with an intermission. Tickets for adults are $15 while all students are admitted free of charge. There are plenty of ways that you can help make this event successful! Attend the Concert - it will be fun, we promise! Like, Comment, and Share our posts - this helps us spread the word to people who don't follow us on Facebook. Invite your friends to attend the concert and come as a group - word of mouth is the BEST way to promote this special event. Contact your local school director/booster president for promotional materials like flyers, handouts, and more. Speak at your local churches or community groups. Donate directly to the programs at the event. Companies or individuals who donate $25 or more directly prior to the concert will receive their name and logo in the program and on a special "Thank You" banner. Businesses will also have an opportunity to set up a table in the lobby of the concert hall if they wish. Please contact your local school program or Isaac Campbell, (641) 777-4308, for more information. We HIGHLY recommend purchasing your tickets in advance and printing them at home. You can then bring the tickets with you and skip the line. This concert is included with the purchase of a season ticket. Please remember that, although that student tickets are free, you must still add them to your order if you plan to bring students with you. Everyone needs a ticket!